[ Henry C. Rawlinson, Assyriologist etc ] Autograph Letter Signed "H C Rawlinson" to "My dear Alice", wife of "Stephen" [Gatty], judge. [Embossed "India Office, Whitehall, S.W.] Sylvester House, Eastbourne, 12 August [no year; 1892?]. Two pages, 8vo, bifolium, sl. staining, but text clear, mainly good condition. He is forewarding two notes from Lord Knutsford [not present], but "you have probably heard by Telegraph direct from Stephen on the subject.. I don't exactly understand the dates or order of the notes but the essential thing is does Stephen accept the Puisne Judgeship [of the Straits Settlement] or not? [ Sir Pendrill Varrier-Jones, founder of the Papworth Village Settlement, pioneer in the treatment of tuberculosis. ] Typed Letter Signed ('P. Varrier Jones') to 'Robin Goodfellow' of the Cambridge Daily News, referring to his struggles. On letterhead of the Papworth Village Settlement, Papworth Hall, Cambridge. 5 April 1934. 1p., 8vo. In good condition, lightly aged and worn, laid down on leaf removed from album (with ticket and two press cuttings relating to the Honorary Degrees Ceremony on the reverse). He has seen a 'Table Talk' article in the Cambridge Daily News, and writes to thank the pseudonymous individual for 'this very great appreciation of my work'. The Deportation of the Norfolk Islanders to the Derwent in 1808. I. The Settlement of Norfolk Island. II. The Deportation to the Derwent. Tasmania: William Grahame, Jun., Government Printer, Hobart. 1895. 12mo: 26 pp. In original printed wraps. Stapled pamphlet. Unopened. The only copies on COPAC at the British Library and Oxford. 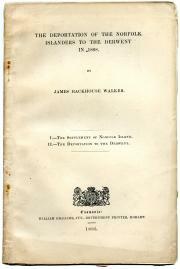 For more information about Walker (1841-1899) see his entry in the Australian Dictionary of Biography. Autograph Letter Signed to "These / For the Right Honble. the / Principall officers of his Mats. Navy / in London" [address panel]. Plymouth the 14th october 1666. One page, folio, staining and other defects but text legible and complete, as follows (spelling adjusted): "This day the [Sephard?] and Forester arrived here with four ships from Ginny [Virginia] and two from the West Indies bound for London - the Eagle [for "Egell] now in the sound, notwithstanding teh Extreem of weather, the Guernsey in [Catwater] Expecting Cables for her security as [lost], by my last to yor. Hons.